Are you tired of your old gold pendant? Perhaps you have a locket that's sitting in your drawer gathering dust. Why not trade them in and earn instant cash for it. 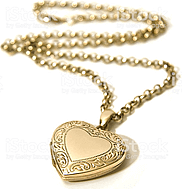 Brisbane Gold Buyers purchase gold pendants, gold lockets and any other gold items you wish to sell. Our prices are quoted live on our website 24 hours a day. And the best thing is, we come to you, so you can earn instant cash on the spot for your unwanted gold. Contact us now to turn your unwanted gold into cash. No Appointment Necessary, come visit us at Shop 1, 663 Ipswich Road, Annerley. We are open between 9:30am - 6pm Monday to Friday. 10am to 3pm Saturday. Closed Sunday.